The Dryerbox has been classified by Underwriters Laboratories, Inc. for models 350, 425, 480, 3D, and 4D for use in Through-Penetration Underwriters Laboratories Through Penetration Firestop System Firestop System Number W-L-7129. 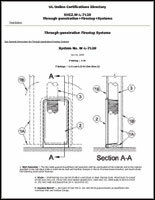 Click here for a direct link to UL's online specifications for firestop system installation. Click here for the Dryerbox Classification Listing (for Canada, here). These key components are noted on the instruction sheet that comes with every Dryerbox. The following are highlights to comply with the UL Classification for through-penetration firestop systems. To achieve a fire resistance rating (one-hour F & T) 2X6 framing is required. The Dryerbox unit must be installed in accordance with the UL Cabinet System listing. Drywall requirements: An extra layer of type-X drywall must be installed in the ID of the stud cavity in which the Dryerbox is located. Drywall must be attached to nailers (minimum 1" X 2") located on the inside of the cavity wall studs. Secure nailers to wall framing at max 18 in. OC. The screws used to attach the inner layer of drywall shall be spaced a maximum of 18 inches apart. Metal and wood framing configuration drawings used to assist with determining what additional materials are required in your particular 1-Hour rated demising wall assembly. Easy as: 1. Recognize your assembly. 2. Click to print out the respective engineer’s letter with UL’s Through-penetration Firestop System. Studs and Insulation requirements - see table below. 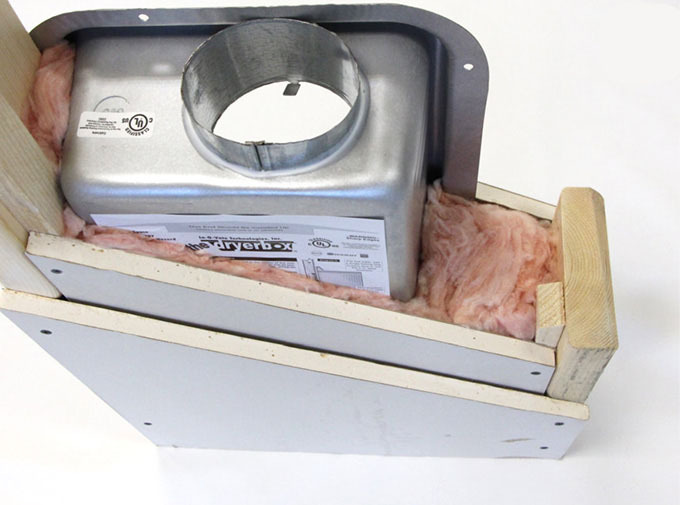 Note 1: The entire depth of stud cavity with Dryerbox® must be filled with R19 fiberglass batt insulation. Additional insulation shall be added within the cavity as necessary to completely fill all voids around the periphery of the Dryerbox and around the dryer vent pipe. Note 2: The entire wall cavity containing the cabinet shall be tightly packed to full stud depth and cavity height with mineral wool batt insulation having a min density of 4 pcf. In addition, the wall stud cavities immediately adjacent to the cavity with the cabinet shall be insulated with min R13 glass fiber batt insulation (or min 4 pcf mineral wool batt material) for the full depth and height of the stud cavity.